Fortune reported an interesting survey on iPhone sales in Japan. Mashable, CrunchGear and some other blogs have also reported the news. From Japan, I am trying to provide some more detail for people who want to better understand this news. Yes. The shops which give their POS (point of sale) data to BCN include some nationwide chain stores, such like Eiden, K’s Denki, Bic Camera, Best Denki and, you may know this company name, Amazon Japan. The big chains missing I think are Yamada Denki and Yodobashi Camera, but it must be good enough. 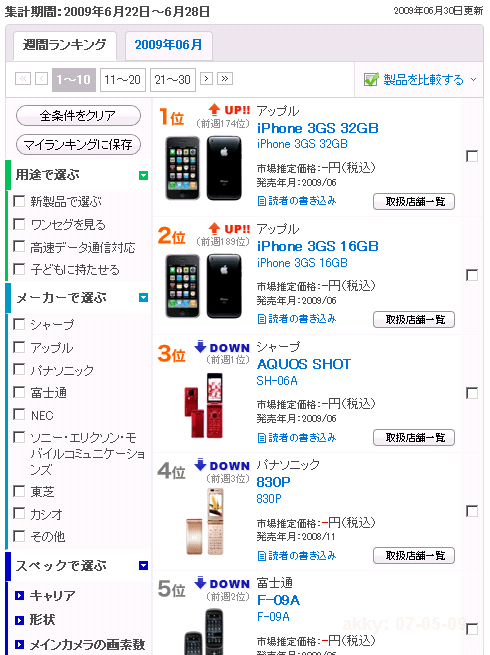 Some people commented that the ranking is only for “smartphones,” which are not popular in Japan. Is this correct? No. The ranking includes all cellphones by Sharp, Panasonic, Fujitsu, etc. iPhone 3GS was the best selling cellphone in Japan. It is true that the smartphone category is not as popular as it is in the US. Regular phones have a lot of, sometimes useless, functionalities. So regular cellphones can do most things smartphones do. In Japan, “smartphone” often means that the phone has a qwerty keyboard (which is not essentially important for Japanese input), and sometimes means that the phone does not have access to cellphone web networks and applications like DoCoMo i-mode and the like. What is the reason behind this? Is iPhone suddenly so successful in Japan? The ranking referred to is a “weekly” ranking for the 22th to the 28th of June. The new iPhone 3GS started to be sold in Japan on June 26th. For your information, interestingly, the iPhone 3GS (32GB) and (16GB) seemed to be ranked at No. 174 and No. 189 on last week’s ranking, even before its release date. The old version iPhone 3G 16GB is ranked at No. 27 down a bit from No. 23 last week, which is also interesting. Who buys the old one when the new one is coming and your payment will not differ? Well, only for a week, when the new product was released. There is an interesting story around the BCN ranking. On April 26th 2005, the BCN Ranking of music players reported [J] that the newly released Sony Network Walkman produced a major reversal in memory audio player rankings against iPod shuffle, becoming the No. 1 music player in Japan. iPod market share later in the same year, 2005, was announced as “over 60%” by Apple Japan [J], by using BCN stats. Why don’t regular people jump on the iPhone in Japan? There are many unresolved issues for the iPhone in the Japanese market. If I had to choose just one, I would mention that you cannot register on all three major social networking services, Mixi, Mobage-Town and Gree on the iPhone. Apple seems to try to keep the same hardware/software all through the world, which is a beautiful policy, and forcing domestically customized non-standard protocols and rules on Japanese cellphones is not neat. But would you buy a new cellphone/smartphone if you will not be able to use Facebook, MySpace or other common social sites? Only either rich people who can buy and maintain two cellphones or people who have no friends can be satisfied with the iPhone. Here in Japan, “No. 1 in USA” (Google [J]) is still a magical catch phrase for many consumers. This cliché can be seen on Hollywood film ads a lot. As there are 52 weeks in a year, there are almost 50 “No. 1 USA” movie per year. Becoming No. 1 even for a week is better than never being No. 1, though. In that sense, the iPhone 3GS is doing well in Japan, with a good start. Fortune refereed this article and corrected things I had pointed out. I wrote an follow-up article about how the second week ranking goes. iPhone disappeared from the same top 10 ranking, but no one says iPhone lost in Japan. I don’t think Mixi, MobeeTown or Gree can be compared to the Social Networking giant that Facebook is– and even then, people in America by phones all the time that can’t access Facebook. The fact that it can’t access those sites is less Apple’s problem and more Mixi and friends’ problem. They are the one who call Softbank iPhone addresses “computer addresses” even though they ONLY come with cell phones. The only reason they closed off their sites in the first place was to keep non-Japanese people out of them. Those sites are doing everything they can to keep people out anyway– which makes them a different animal from almost any service in any other country. As far as I know, there’s not a single American site that specifically blocks non-USA IPs or e-mail addresses AT ALL.There is no technical reason why Softbank iPhone addresses can’t register on Mixi. It’s the site’s fault, not the other way around. Which are “giant” depends on which language you speak. If you mean just by size, Chinese ones are the real giants I think. I agree that Japanese services are exclusive for non-Japanese speakers/non-Japan residents. I guess that is mainly by business reasons. > there’s not a single American site that specifically blocks non-USA IPs or e-mail addresses AT ALL. Pandora, Hulu? Are they minor services in USA? Also, Digg does not allow any Japanese post systematically. I should add too, that given that the iPhone is on Softbank, Japan’s weakest carrier, those numbers mean more than you might otherwise give them credit for. Sony is one of the biggest, most recognizable companies in Japan– so it’s no surprise they were #1 in one of their core markets. Apple is important too, but buying an iPhone means subscribing to Softbank– a far higher price of entry than buying a walkman and tossing your old one out. Well, Pandora and Hulu do block outside IPs, but those are for legal and contractual reasons– ie, they will get sued and destroyed by the RIAA, MPAA and television consortiums if they allow non-USA IPs to access their content. And it’s stupid– yes, but it’s not the site owners’ fault. And those sites in particular are special because they block a lot of things, even in the USA– non-computer clients, like Xbox’s, etc. are blocked from those sites EVEN IN AMERICA. No idea on Digg though. I wouldn’t call that a mainstream site anyway, given all the other problems it has with a small group of people controlling all the content and the amount of blind digging and whatnot. With Mixi and friends, I think the emphasis is on keeping foreigners out– without any really good reason, other than to maintain the air of exclusivity. And at least as far as Mixi is concerned, 90% of the accounts on their are fraudulent BS anyway. Mixi could allow iPhone addresses in the blink of an eye, and they’d still be able to maintain their Japanese exclusivity, but they want to be a “携帯サイト” instead of an internet site. Just like DoCoMo wants i-mode, instead of the real internet. It’s all about money and control, whereas the iphone, with its unfettered internet access and unlimited data plans promote openness. Apple, which could make a deal with No.1 or 2 career in each country, could not do that with DoCoMo, is Apple’s fault. I am sure that DoCoMo was glad to sell it if they are allowed appropriate localization and reasonable offer. Mixi/DeNA/Gree have their reasons like Pandora/Hulu/Digg have something. I am on your side, I dislike the limitation but they are not my companies. And now most DoCoMo/au/Softbank cellphone provides “full-browsers” for the “real” internet. You may take unlimited plan, too. It’s Apple that ignores rich and varied cellphone website history in Japan. I disagree– I don’t think DoCoMo was willing to allow a non-iMode phone on their network. (They could very easily make an iMode application and load it on every base phone– but no one would use it and give DoCoMo advertising money because real internet is simply a lot better.) The CEOs at DoCoMo are very resistant to anything non-iMode. I’m not sure Localization is an issue, as I use my phone in Japanese and haven’t run into anything untranslated yet. There’s also a Japanese application store, too. DoCoMo & AU do allow full internet on some devices– but their plans are very very expensive and let’s be honest here, the iPhone/iTouch is the only device on the market that has a good user interface for full web browsing. I use my iPhone like I would a computer. You use an AU or DoCoMo phone like you would a phone. The difference is very important. > I use my phone in Japanese and haven’t run into anything untranslated yet. There’s also a Japanese application store, too. Translations are usually different from the originally written texts, such like my English. > NO REASON why Mixi can’t allow Softbank iPhone addresses onto their network. It’s not only Softbank iPhone, all smartphone, Willcom #4 and e-mobile #5. Allowing full-broswer or PC browsers to the mobile sites have some technical security reasons. So it is again business trade-off. > I use my iPhone like I would a computer. You use an AU or DoCoMo phone like you would a phone. Yes! That is a very problem. Regular people’s hope is not using computer. Japanese, especially young people have been using cellphone interface and sites for 5-10 years and they are not attracted with any “portable PC”. > I don’t think DoCoMo was willing to allow a non-iMode phone on their network. DoCoMo sells some smartphones without i-mode. Mainly for enterprises and geeks, not so successful though. My guess is Jobs asked too much for the deal. FWIW, with the iPhone 3.0 firmware, you can now easily set up a softbank.ne.jp address, which works as an MMS gateway. This is sufficient to allow registering for mixi. But they still require following a confirmation link on the phone, which doesn’t work in Safari. The other two sites you mentioned appear to work in a similar way, detecting a PC-style browser and redirecting to a PC site which doesn’t let you register directly. It seems like this sort of thing should be easily spoofable, but I’ve found very little technical details on the subject. At least that I could easily understand – I suspect they’re all in japanese. Those Japanese cellphones have an unique tracking ID and the cellphone websites can use it. It’s like the one Intel tried to introduce long ago and failed to make it on by default on their CPU. There are also other reasons, but not easy to list them up in right manner in English for me. If you can read Japanese I know some books to recommend. When I say you use the phone like a phone, I mean that sure, people are used to it and have used it like that for some time, but they don’t know better. I show people my iPhone around here and it blows their mind. My girlfriend often looks things up on her AU phone to find a name or address, and then we pop that into my iPhone to draw a map or find reviews. We have regular phone interfaces in America too, and have had– I used one for years before I got my iPhone, but the fact is, regardless of preconceptions and current use, when something better comes along, it explodes in popularity. DoCoMo also only started selling non-iMode smartphones as recently as one or two years ago, and only to businesses, so its no wonder they aren’t popular. They are also expensive compared to other phones. Yes, the iPhone is expensive too, but overall, the plan + the phone is cheaper than DoCoMo’s offerings, even though the hardware is more expensive. Also, to say that Apple can’t do localization correctly is a misnomer. You’re seriously telling me that Apple translation and Japanese localization is subpar? Apple’s Japanese localization isn’t good enough for DoCoMo? They sure sell a lot of computers and iPods to Japanese people with wrong translations and localization then. You can not cheat combination of unique terminal ID and career IP range check by modifying headers. If you can, whole Japanese cellphone ecosystem collapses down. If someone shows appropriate applications on DoCoMo/au cellphones, those people got amazed, too. I don’t agree iPhone interface is superior or advanced for all Japanese. Vendor lock-in story is strange. Apple is just doing that. No open specification, no open hardware. > mainly because that’s where the money is. > You’re seriously telling me that Apple translation and Japanese localization is subpar? No. I say not all iPhone app vendors can make good level Japanese localization, but most of i-mode/i-appli vendors make applications at native level. 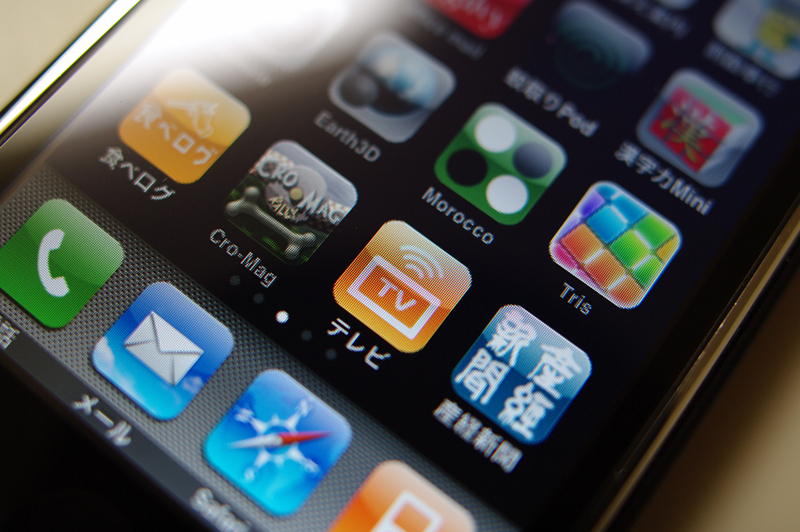 What does App Store application localization have to do with DoCoMo refusing to partner with Apple on the iPhone? What you’re saying is that DoCoMo wants absolute control over everything you load on your iPhone and I agree. That’s the reason why Apple couldn’t sell it to DoCoMo, because the iPhone doesn’t fit into DoCoMo’s ecosystem of completely control over their mobile devices’ software. Again, the Mixi thing isn’t about support. It’s about lock-out. Mixi doesn’t have to do anything to support the iPhone. Mobile Safari can render the PC version of the page just fine without changing anything. They say the iPhone isn’t a phone. And that’s fine. But honestly, who uses Mixi anyway? Wouldn’t unfettered 2chan access be more inviting to Japanese people anyway? I feel like most Japanese 携帯サイト are for 出会い系 and other bad purposes anyway. > What you’re saying is that DoCoMo wants absolute control over everything you load on your iPhone and I agree. As same as Apple wants that on iPhone, yes. It’s two huge companies’ head-to-head business issue. Why does DoCoMo have to obey the Apple’s ecosystem? What is the advantage for DoCoMo? Pursuading DoCoMo, Mixi or others is Apple’s task. > who uses Mixi anyway? All three social networks are earning a lot of money and IPO-ed. Though I myself never paid them. I think the advantage for DoCoMo and co. is clear– Softbank has gained a tremendous amount of new subscriber revenue and contracts from the deal, all of which are paying for a full data plan, as well as a phone plan. What DoCoMo loses is the ability to bully its customers into viewing its ads on iMode and over its SMS platform. I got more ads in my year and a half with DoCoMo on my phone than I’ve ever received in my life from any phone company. All of these were unblockable carrier SMS advertisements. One day, these revenue sources are going to dry up when people decided to stop getting pushed around by DoCoMo on their own phone. iMode was fine for its time, but it’s not going to be forever, and like a typical Japanese company, DoCoMo is failing to realize this until its too late. I imagine that those companies are making enough money to survive and attract investors because they are bleeding out cell phone users with advertisements. This is a good short term revenue plan, but they’re going to have to change to survive in the future I think, see above. > Softbank has gained a tremendous amount of new subscriber revenue and contracts from the deal, all of which are paying for a full data plan, as well as a phone plan. This is very suspicious. There are many signs that they are in hard time even with the subscribers increase.